Putting a home gym in an extension is a good way of using extra space. The whole family can use it as and when they want to without having to pay fees to a leisure centre or gym. You can put gym equipment into any room of course, but if you know in advance that one of the rooms that you are adding with the extension will be a gym then you can plan ahead. Extra Shower or Hot Tub? If you think that you are going to use the gym extension a lot then you could consider putting a shower room next to it, or perhaps even a hot tub. This will give you the ability to relax after all that exercise. If you have the space and the money a swimming pool would be nice too. Incidentally if you are a keen swimmer and can't have a proper pool, you might be interested in looking at small pools with pumps that make currents. They can be as small as seven by twelve feet and you swim against the current but stay in one place. The weight of some gym machines could be a cause for concern. Certainly heavy weights themselves, if you're a power lifter, could go through the ceiling if they were dropped in a first floor room. A concrete section floor could be a good idea for an upper storey gym extension. Find out the weight of all the machines you want to put in and ask a structural engineer for advice if you are uncertain. One the other side of the coin if you are really more interested in floor work or aerobic exercise such as skipping or rowing then there should be too much to worry about as far as the floor goes. If you want to suspend apparatus from ceilings, like chin-up bars, then make sure they are mounted into the ceiling joists. Cellar conversions are good for gyms as there's no real need for windows and you don't need to worry about neighbours looking in. But if you go for a cellar make sure there's adequate ventilation otherwise it could begin to pong after a while. Depending on the sort of equipment you are going to put in the gym room you might need more electrical sockets that you thought you would. Machine like treadmills need power and even the simplest steppers and cycling machines have programmable consoles that need power. Make sure that there are adequate power points situated all the way round the room so that you can minimise trailing leads across the floor. 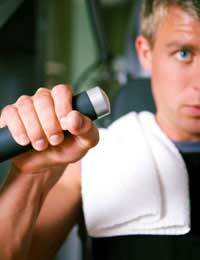 Even if you do that you will need power for the entertainment systems in the gym. Exercise is a lot more enjoyable if it's done to music, or you can put a television on the wall to catch up on news and entertainment while you sweat. You could also consider putting a PC in the room, maybe mounting it to a treadmill so that you can work as you work out. If you are more green oriented then you can restrict this by buying machines without flash consoles and programmable buzzers and they'll probably be cheaper to buy in the first place and certainly cheaper to run. Soon power for a gym extension can come from the gym machines themselves. Already on sale in America, and sure to appear in the UK soon, are cycling machines that use dynamos to generate power which can then be used to run the lights and entertainment systems in gyms. Prices being talked about in the UK are not cheap but if you factor in saved gym fees as well as power bill savings you could achieve payback in eighteen months. Now that really would be an unexpected benefit from a gym extension.